Everyone knows that Star Wars merchandise have made the franchise extremely profitable. With all the cool characters and vehicles its not hard to see why it translated so well to toy form. The big toy of the Star Wars lot all is the Battle Action Millennium Falcon, made by Hasbro. It is not cheap, costing £101.99 at Argos, Toys R Us and most major UK toy retailers. At John Lewis it costs £105.97. It includes three 3.75 inch high figures: Chewbacca and new characters Finn (Jakku) and BB-8. The Falcon features secret compartments, a cockpit and sleeping stations. 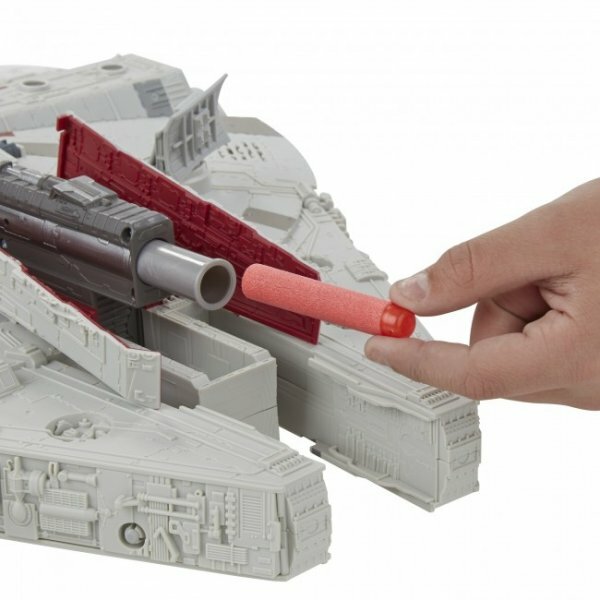 The coolest feature however is the Nerf gun laser blaster which pops up from the body of the Falcon and fires foam Nerf bullets with a push of the button. This beast of a toy is powered by 2x AA laser power cell batteries (not included).